With the almost unfathomable increase in web traffic over recent years, driven by millions of connected users, businesses are gaining access to massive amounts of complex, unstructured data from which to gain insight. When Hadoop was introduced by Yahoo in 2007, it brought with it a paradigm shift in how this data was stored and analysed. Hadoop allowed small and medium sized companies to store huge amounts of data on cheap commodity servers in racks. The introduction of Big Data has allowed businesses to make decisions based on quantifiable analysis. Hadoop is now implemented in major organizations such as Amazon, IBM, Cloudera, and Dell to name a few. 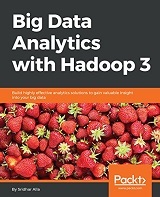 This book introduces you to Hadoop and to concepts such as 'MapReduce', 'Rack Awareness', 'Yarn' and 'HDFS Federation', which will help you get acquainted with the technology. Hadoop is one of the most important technologies in a world that is built on data. Find out how it has developed and progressed to address the continuing challenge of Big Data with this insightful guide.